MEDICINE Bag- (BPCRS/ML/shooters friend, Rifleman’s must-have) Handmade, 6” x 4” dia. Ever wonder where trappers and native americans kept their personal items? Look no farther than this medicine bag. The perfect shooters storage accoutrement, for your gold, silver, back pills, OBI, Aleve, Blow tube, Maalox, skittles (M&M’s will melt), site inserts, ....or anything else that's no one's business but yours. Due to limited amount stock I'll contact you about which colors are available, sorry. 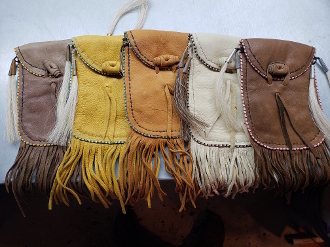 Medicine bag is perfect size for your hip and comes with two robust belt straps to insure it stays putt. Handmade and decorated in trapper era fashion, including the New York size gobbler beards. NOTE: Rumors are that the NRA is considering this item as a possible requirement for aging BPCR shooters so don't wait too long and get your private stuff secured now.